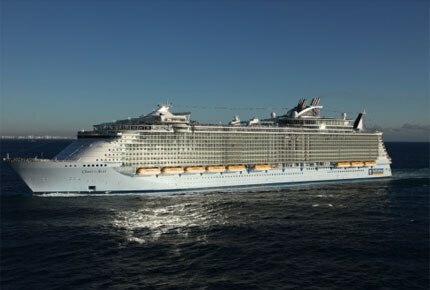 Oasis of the Seas is the biggest, tallest, widest and roomiest ship afloat, but your chances of getting lost in this elegant leviathan are rather small. That's because the flow of this ship is so logical. And this is no easy matter. Oasis, a member of the Royal Caribbean fleet, was built at a cost of $1.5 billion, is 1,187 feet long, has 24 guest elevators, sixteen passenger decks, and weighs 225,282 tons. Details range from an enormous eighteen-foot deep AquaTheater pool to delightful tiny raised symbols on elevator buttons. Attention to detail is also evident in the multitude of ways the ship's architecture and motifs help passengers find their way to onboard attractions. Press the keypad's merry-go-round horse and you'll find yourself on the Boardwalk — one of the seven shipboard neighborhoods. These "neighborhoods" help passengers keep their bearings. Aside from the Boardwalk, a Coney Island-esque area that kids will love, the distinctive themed areas include: Central Park, the Royal Promenade, the Pool and Sports Zone, Vitality at Sea Spa and Fitness Center, Entertainment Place and Youth Zone. Located mid-ship, Central Park is a verdant recreation of a city park with more than 12,000 plants and 56 trees. The sidewalks and flowering gardens are flanked by upscale shops and restaurants including 150 Central Park, with a 23-year-old chef at command in the kitchen. Keriann Von Raesfeld, who hails from California, creates the daily changing menus and Modern American dishes served at this elegant restaurant. Other options at Central Park include Chops Grille, a steak house, and Giovanni's Table, a Tuscan-themed family place where children are encouraged to make their own pizzas. You can also stop for a drink at the Rising Tide Bar, an amazing watering hole that travels vertically between Central Park and the Royal Promenade decks. The Promenade, a venue with a wide mezzanine where many can and do gather, features a fabulous array of boutique shops, small restaurants and specialty clubs like the luxe Champagne Bar and the Latin-inspired Boleros. Here you'll also find late-night street parties and parades. Two giant arched skylights — the Crystal Canopies — flood natural light down from Central Park, which is overhead, further enhancing the open, airy feel of Royal Promenade. The Boardwalk is a hub for activity especially for the very young and young at heart. At the center of this family-oriented area is The Carousel, a beautiful recreation of the boardwalk favorite with hand-carved horses from Carousel Works, the world's leading carousel manufacturer. Also here, at the stern of the ship, is the AquaTheater, an outdoor amphitheater with day- and night-time diving and theater performances by Olympic and NCAA champion water sports athletes from around the world. The offerings here range from the sublime to the ridiculous: the sublime being a jazz club—Jazz on 4; the ridiculous, a standup comedy club called Comedy Live (the hottest ticket on the ship). Concerts and theatrical productions take place at the Opal Theater. Studio B is an ice palace where skating shows dazzle. And for pure excitement, there's Casino Royale, the Oasis' gambling emporium reminiscent of the great and glamorous gaming halls in the south of France. There are 21 pools onboard the Oasis. The Beach Pool offers a gently sloping sandy shore that leads to a cool saltwater pool. Beach parties are held here at every sailing. There are also private cabanas, two Flowrider surf simulators, and the Zip Line for thrill seekers who can coast along an 82-foot long cable suspended nine decks above the boardwalk. There's a nine-hole golf course in this neighborhood as well as a teen center complete with a video arcade and a hamburger joint. The two-deck Vitality at Sea Spa and Fitness Center offers traditional massages as well as more exotic therapies such as Thai herbal poultice massage and bamboo massage. The menu also includes acupuncture and Botox. The ultimate offer is the opulent 24K-gold facial, which uses a gold-leaf mask and other precious ingredients. Cutting edge fitness equipment includes gravity trainers; Expresso stationary bikes that have more than 30 virtual environments on video monitors, spinning areas and the Omega Kinesis Wall — a panel of grips, cables and weights that enable hundreds of circuit style exercises. Oasis of the Seas sails from her homeport of Port Everglades in Fort Lauderdale, FL. to Charlotte Amalie, St. Thomas; Philipsburg, St. Maarten; Nassau, Bahamas. Cabins start at $1,199 for a seven-night Caribbean voyage. Additional information at www.oasisoftheseas.com, or call 800-ROYAL-CARIBBEAN.